This story was updated at 6:05 p.m. EDT. NASA isconfident that its first test flight of the new Ares I-X rocket will go wellnext week. But if it ends in an explosive failure, the agency affirmed that thenearby space shuttle Atlantis atop its own launch pad will be safe. Spaceshuttle program manager John Shannon said it was his call to move Atlantis toLaunch Pad 39A for its planned Nov. 16 liftoff from the Kennedy Space Center in Florida, even as NASA prepares for the AresI-X test launch on Oct. 27 from nearby Pad 39B. The risk ofa disaster at the Ares I-X launch pad has been assessed, Shannon said, butshould not endanger Atlantis. Much of the shuttle is protected by a RotatingService Structure, a shell-like covering that guards against weather, he added. 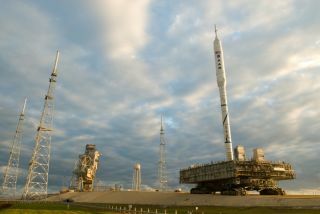 About 40percent of all new rockets end in failure, NASA has said, and Ares I-X is notexempt from those chances. ?Theimpact zone for an explosion [at AresI-X?s launch pad] would just barely clip Pad A,? Shannon said. The $445million Ares I-X rocket is a suborbital prototype of NASA?s two-stage Ares Ibooster designed to replace the shuttle fleet by launching astronauts on Orioncapsules for trips to orbit and, ultimately, the moon. The rocket concept andNASA?s overall human spaceflight plans are in the midstof a major review by President Barack Obama?s administration. ?Any timeyou launch something new there?s always the possibility of an accident. This isstill rocket engineering,? said John Logsdon, a space policy expert andprofessor emeritus at George Washington University in Washington, D.C.
Officials with NASA?sConstellation program, which oversees the development of the Ares I rocketsand Orion spacecraft, said Friday that there's a 1-in-10,000 chance of a potential disaster during the Ares I-X launch attempt. That's well within the safety requirements of a 1-in-1,000 chance of a failure, they said. But all tests to date point toward a successful launchtest next week, Shannon said. ?If wereally thought that [Ares] I-X was going to have a problem, then we?re notready to go launch, even on a test flight,? he added. A full AresI rocket would use a five-segment solid rocket booster a bit larger than thefour-segment ones used on NASA space shuttles. Ares I-X, however, will use thefour-segment rocket motor and a dummy fifth segment. It is capped with amock-up of the Ares I second stage, Orion capsule and launch abort system. Logsdonsaid the relative simplicityof Ares I-X, when compared to the Ares I design, may make success morelikely. ?The stageitself - the four-segment solid stage - has been launched how many times now?250 or more times with one problem - because it?s the strap-on for theshuttle,? he said. ?It?s the most reliable rocket stage in the world.? The AresI-X towers 327 feet (100 meters) above Launch Pad 39B, a launching site thatuntil recently was used to fly space shuttles, and has been converted for the newbooster. Pad 39A,which NASA is using for its remaining shuttle missions, is about 1.6 miles (2.5km) away with Atlantis. The Launch Control Center, NASA Press Site and otherstructures are outside a 3-mile (4.8-km) safety perimeter from the launchingpads. ?Generallyspeaking we don?t put two vehicles out [at once],? Jon Cowart, Ares I-X deputymission manager, told SPACE.com. But in this case it was deemed to be anacceptable risk, he said. Unlikeshuttle launches, which take nearly nine minutes to reach orbit, the Ares I-X testflight will take just over 2 1/2 minutes. The rocket is expected to fly 28miles (45 km) high, experience stage separation 43 miles (69 km) down range andend 147 miles (236 km) over the Atlantic Ocean when the dummy upper stagecrashes into the sea. ?While thisis the rocket business and you can?t make anything one hundred percent safe,?Cowart said he was confident the rocket was in good shape and would fly safely. ?I really, really do? feel confident that it will take off on time and safely,he said. SPACE.comStaff Writer Clara Moskowitz contributed to this report. SPACE.com will providefull coverage of NASA's Ares I-X test flight with Moskowitz in Cape Canaveral,Fla., and Managing Editor Tariq Malik in New York. Click here for full mission coverage.